A MicroMarket is a designated area that allows staff and visitors to browse and select food, beverages and other items in a convenience store fashion and then use a self check-out facility. This latest innovation in technology is set to replace or complement existing vending services or staff canteens in certain office environments. . The system utilises security technology for unmanned payment, allowing staff to enjoy great food and beverages on site 24/7 with absolutely no staffing costs. The system allows companies to utilise or redesign an existing breakout or meeting area and turn it into a multi-functional area offering hot and cold drinks, food, snacks and confectionery. By using a microwave oven hot meals can also be enjoyed as ambient or refrigerated items can be heated as required. 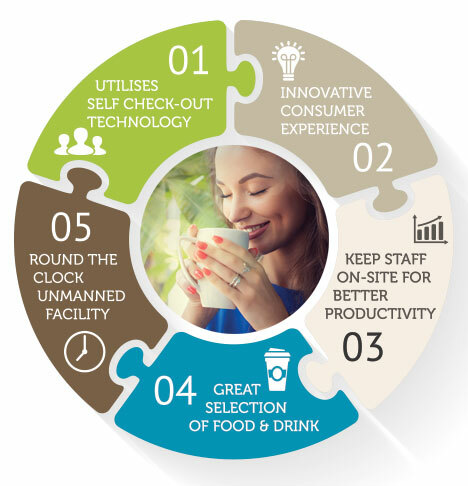 MicroMarkets offer substantial advantages over traditional staff canteens by using the latest technology to reduce labour costs and the flexibility of utilising existing space.